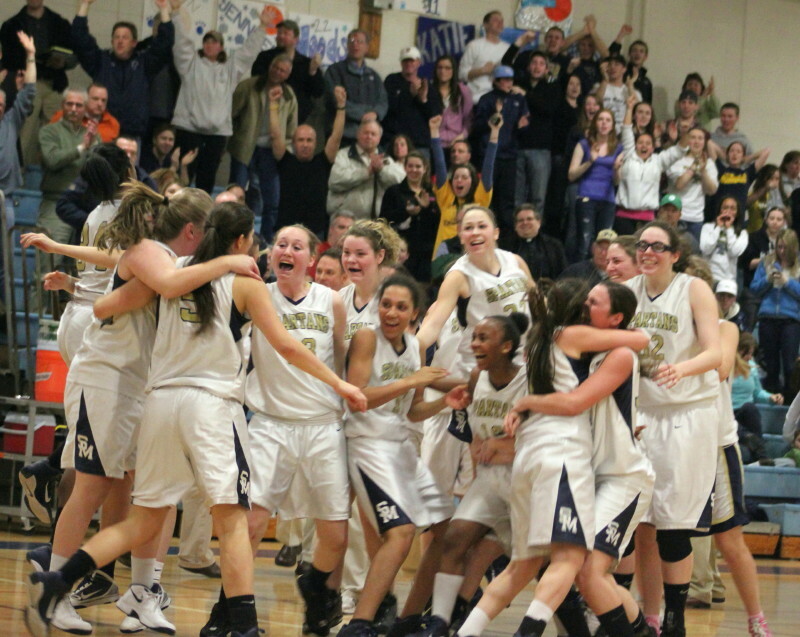 St. Mary’s celebrates their semi-final win over Pentucket. 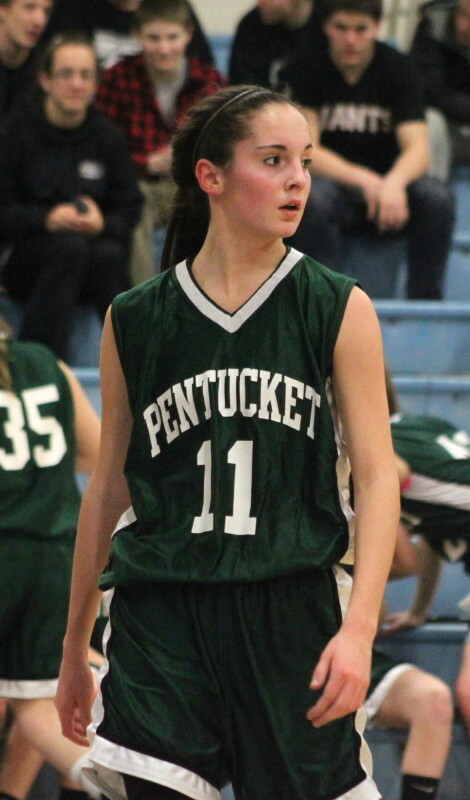 (Wilmington) The Pentucket girls took an excruciating exit in the Division 3 North semi-finals coming up just short in a 62-60 loss to St. Mary’s of Lynn on Wednesday night at Wilmington High School. This was the third straight year that these two teams have met in the D3 North semis and the first time that the Spartans were successful. They now move on to the Tsongas Center on Saturday where they will play the winner of the Stoneham/Ipswich game being played at Wilmington on Thursday night. This game was tied (47-47) with five minutes left and you just knew it would be a close finish. 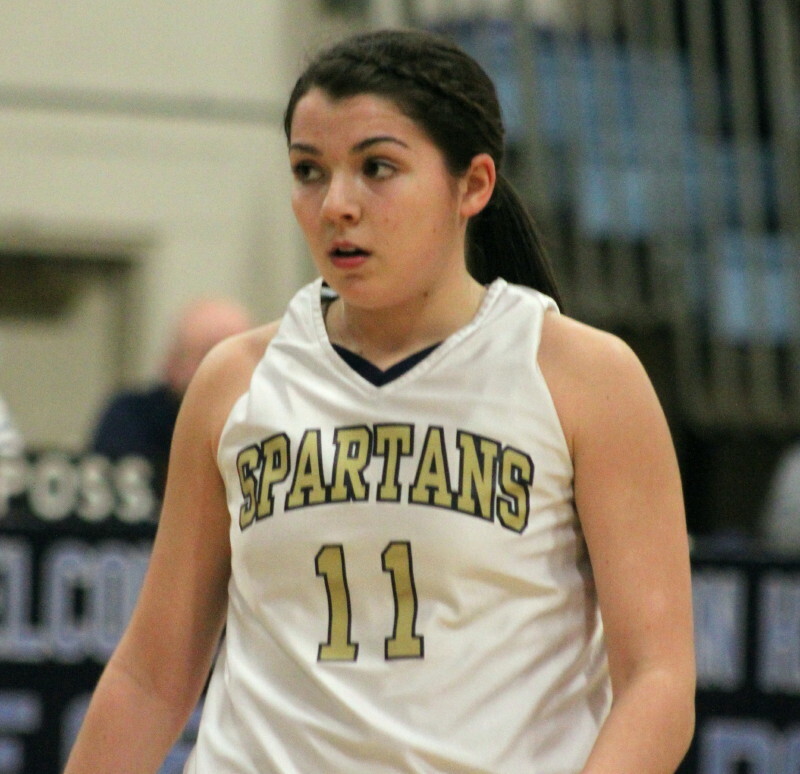 Actually St. Mary’s scored the next four points (layups by Cassi Amenta and Tori Faieta) and never trailed thereafter although the Sachems were a made shot away from overtime or a regulation win. With the pressure mounting, Coley Viselli hit a three from the top of the key with forty seconds left and suddenly Pentucket was within one (57-56). Tori Faieta followed with two free throws while Sarah Higgins made one and we had a two-point game (59-57) with twenty-nine seconds left. 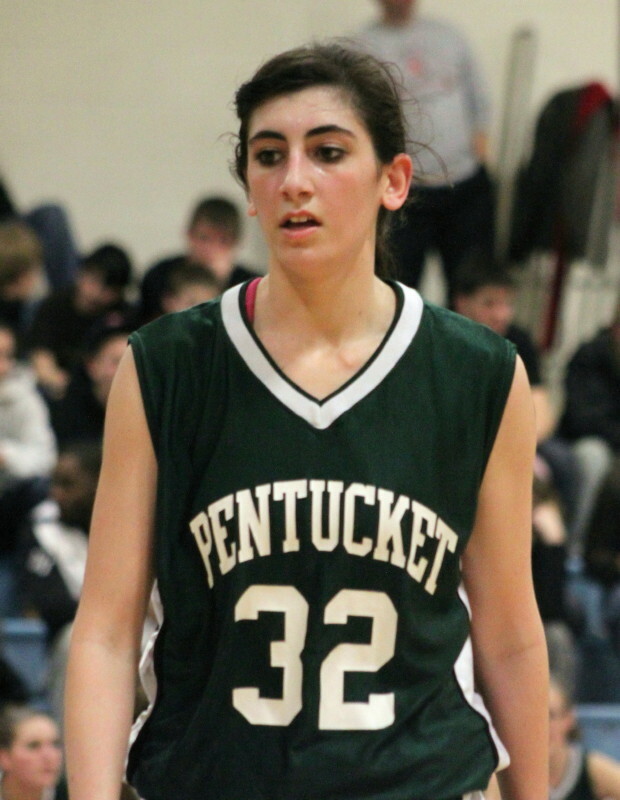 Pentucket then gave the quick foul to freshman Sharell Sanders. 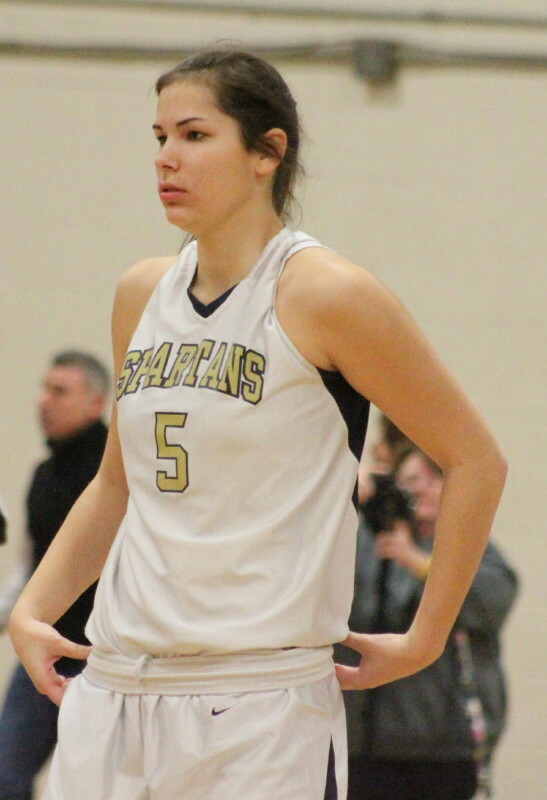 When Sharell missed, teammate Cassi Amenta got the rebound, got fouled and drained two free throws in what may have been the biggest sequence of this game, giving the Spartans a four-point cushion (61-57) with twenty-five seconds left. Those free throws became real important when Coley Viselli hit yet another three, this time from the left corner to make it a one-point game again (61-60) with fourteen seconds left. 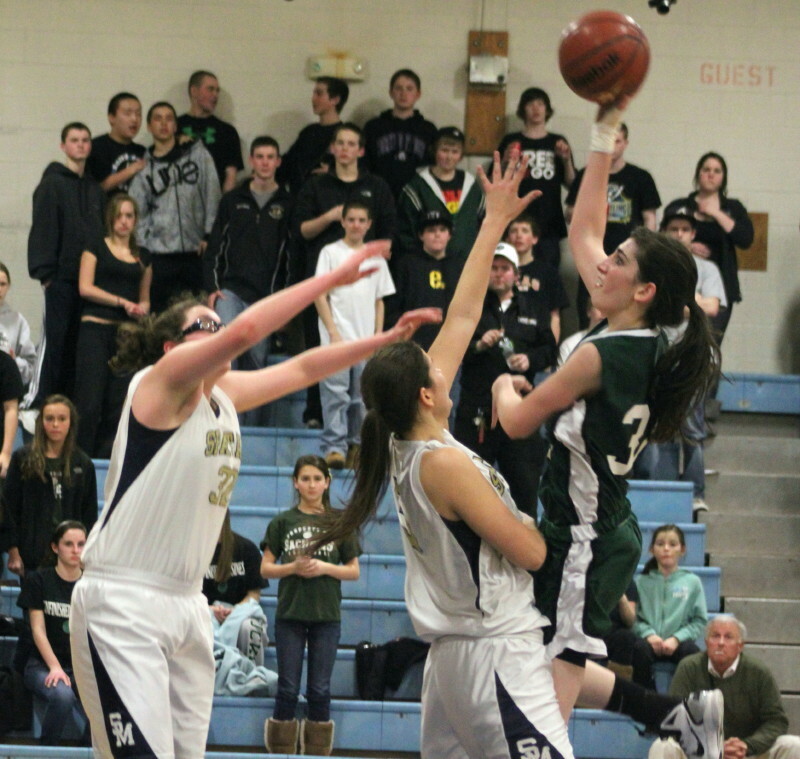 The Sachems followed with another quick foul and sent Kirsten Ferrari to the line. 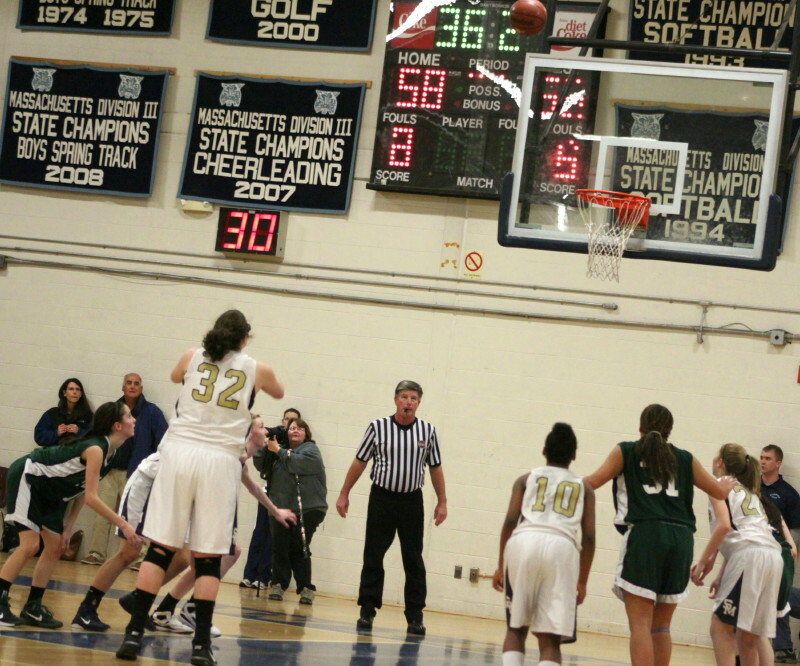 Because Pentucket was over the limit she had two free throws. She missed the first and made the second and so it was 62-60 with nine seconds left. Coley Viselli (18 points) heads for the corner for this game’s last shot. You knew the last shot would be Coley from somewhere. She dribbled into the left-hand corner with Kirsten Ferrari guarding her and took what looked like a 2-pointer to me that wasn’t close to going in and the game ended in the scramble for the rebound. The key for the Spartans was having experienced seniors (Kirsten Ferrari, Cassi Amenta, Tori Faieta) step up down the stretch. Cassi’s offensive rebound of a missed free throw followed by two made free throws couldn’t have come at a better time for St. Mary’s. Pentucket (20-5) now knows what St. Mary’s felt like the past two years when their season ended in the semi-finals. With the nucleus Pentucket returns next season you’d like to believe that they could well be back in another D3 North semi-finals next season with more experienced players. The Sachems had a classic good/bad first half. In the first quarter they collected twenty-three points (23-16 lead) on ten-for-eighteen shooting with no turnovers. In the second quarter, the same team scored only THREE points making just one-of-fourteen shots and turning the ball over seven times. 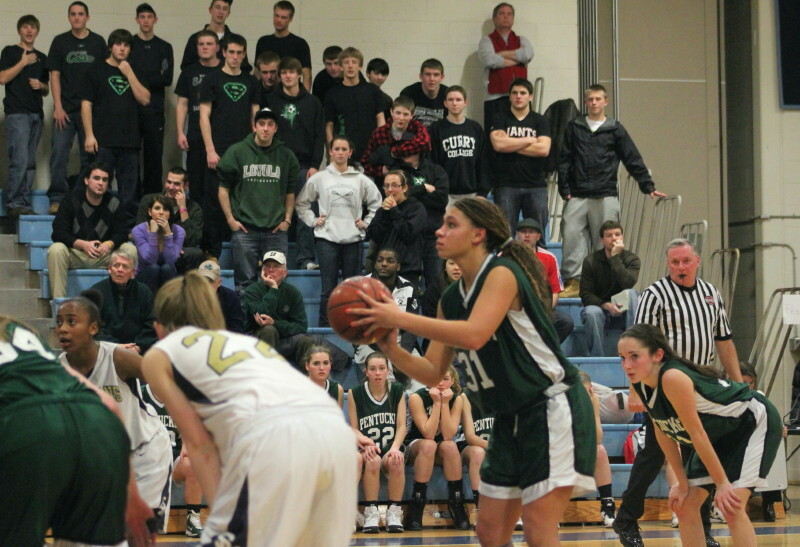 There is no way to explain how such a thing happens but I do know that it left Pentucket trailing, 29-26, at halftime. St. Mary’s still had the three-point lead (41-38) after three quarters. An early layup by Sarah Higgins (assist to Alex Moore) put Pentucket within one before consecutive three’s from Kirsten Ferrari and Sharell Sanders gave the edge to the Spartans, 47-40, 1 ½ minutes into the final quarter. The Sachems rallied with seven straight (47-47) – Vanessa Cahill layup from Sarah Higgins, a 3-pointer by Coley Viselli off the backboard, and a Tess Noguiera layup. This set the stage for the final five minutes which ended with the Spartans celebrating a trip to the D3 North finals. The Spartans (21-4) had four players in double figures – Kirsten Ferrari (13), Tori Faieta (12), Sharell Sanders (11) and Brianna Rudolph (10). 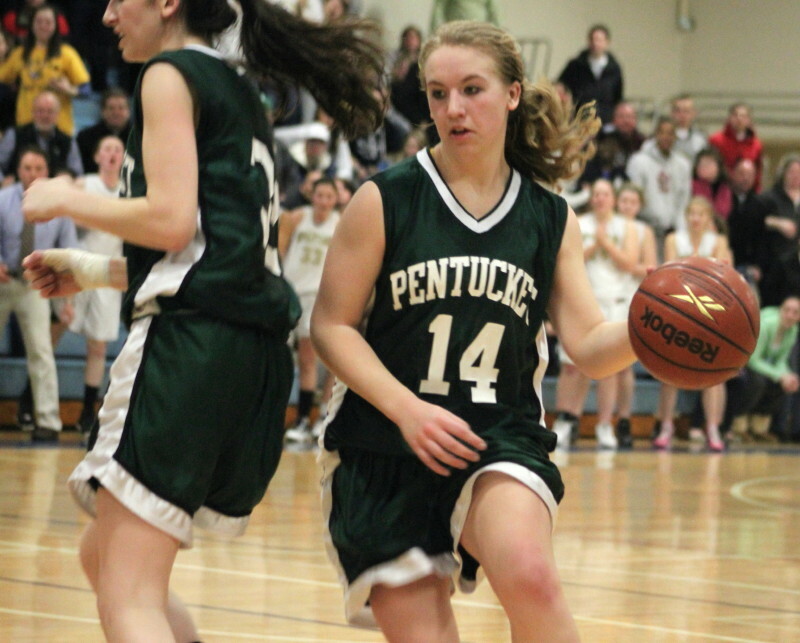 Pentucket was led by Coley Viselli (18), including eleven in the final quarter, Sarah Higgins (14) and Tess Noguiera (13). This makes two tough basketball losses in two days for Pentucket. The boys bowed out to Newburyport on Tuesday night. Ironically, in both games bad second quarters had a bearing on the losses.